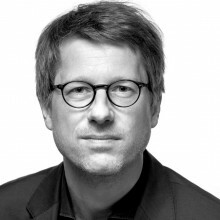 Jan Wagner (b.1971) has won numerous awards including the Leipzig Book Fair Prize (2015, first time ever awarded to a poet) and the highest award in German literature, the Georg-Büchner-Prize (2017). He was born in Hamburg and has been living in Berlin since 1995. Poet, essayist, and translator of Anglo-American poetry, he has been a co-publisher of the international literature box Die Aussenseite des Elementes (“The Outside of the Element“) until 2003. With poet Björn Kuhligk he edited the comprehensive anthology of young German language poets Lyrik von Jetzt. 74 Stimmen (“Poetry of Now. 74 voices“, 2003) and its sequel Lyrik von Jetzt zwei. 50 Stimmen (Berlin 2008). He has published six poetry collections since 2001 and two books of essays. Wagner’s poetry has been translated into more than thirty languages including two English editions: Self-Portrait With a Swarm of Bees (Arc, UK, 2015, translated by Iain Galbraith) and The Art of Topiary (translated by David Keplinger, Milkweed Editions, 2017). Ming Di: One of Marianne Moore’s lines, “imaginary gardens with real toads in them”, comes to my mind again and again when I’m reading your poems. I have seen you taking notes during poetry festivals, yet many of your poems seem to be surreal to me, “Mushrooms” (first stanza), “Steinway,” “Fennel,” “Rain Barrel Variations,” etc. I notice a filtered lens in your view of reality as if the present comes from a distant but fresh memory. Can you talk about how you deal with reality and imagination? Jan Wagner: One of the beauties of poetry, for me, is that it can change our perception of the world around us (which is so seemingly and deceptively familiar) as well as the perception of the language by means of which we try to get to terms with and relate to this world, in an instant, by not using more than four or five lines, only a handful of words, black and white on a sheet of paper. So I do like poems that are grounded in that world, that do relate to its objects and emanations, but at the same time make us see them anew, change them and thus add something to the world. Imagination, then, would be an expansion of reality without ever denying its roots in our very touchable, smellable, visible, sometimes delightful and often atrocious surroundings, all its beauty and its shadows. It goes without saying that I am rather fond of Moore’s famous line that you are quoting. MD: In your poem “Quinces”, I was struck by this line, “the pears and apples/grew towards their names, to a simple sweetness—” even though it was meant to be negative. I’ve never tasted a quince or quince jelly... How do you choose what to write about? JW: What makes the business of writing poems so exciting is that it never seizes to surprise you – in the process of writing a particular poem, but also in the way some hitherto unthought of subject matter comes up. You never know what will catch the eye and the ear tomorrow or next week, and literally anything can be subject of a poem or start the process of composing it. An old pair of shoes? Of course. A historical figure? Why not. A sound or a rhyme, a word or the line of a song overheard on the bus? Absolutely. A used tea-bag in the sink? That especially. Each tea bag has become a hermit “draped only in a/sackcloth mantle” these days. How do you come up with the image of a mantle and, furthermore, made of sackcloth? (LOL) I remember you said in 2010 at Struga Poetry Evenings, where I met you and Ilya Kaminsky for the first time, that poetry should be funny and surprising. Do you still hold to that? What else is important to you? JW: I certainly think that it should be surprising, but surprise cannot be a value in itself. I like to remind myself of what Robert Frost said: “In literature it is our business to give people the thing that will make them say, ‘Oh yes I know what you mean.’ It is never to tell them something they don’t know, but something they know and hadn’t thought of saying. It must be something they recognize.” So the most valuable surprises, in my view, are those that in one and the same moment manage to surprise the reader but seem to be the most natural thing or comparison or image one could come up with. As to poems being funny, well, I do not particularly like poems whose whole sense and purpose is to lead up to a punchline – a punchline which, once reached, renders the rest of the poem unnecessary or trivial. But I do favour irony, not least self-irony, and the sort of sometimes grim humour that arises from a well-founded melancholy. MD: To be “in or out of the mundane world” is a distinction between the two primary philosophies in China. “In” is Confucian, to be secular and concerned about the society. “Out” is Taoist, to be recluse. In the second stanza of “Tea Bag”, when you write about the anticipation/expectation of the hermit tea bag to come out of the tea cup to the upper world, a change of perspectives occurs: to be “in” the tea cup is recluse, to come “out” of it is to enter the world. But this seemingly contradiction is corrected by a well-known saying from China three thousand years ago: to be in the wilderness is a small hermit; to be in the center of the noisy world yet remain recluse is a big hermit. What was going in your mind when you composed the poem? Or what inspired you to write this poem? JW: It really wasn’t more than that, a tea-bag. But in my view, it is precisely the most banal and usually overlooked objects that allow us to get a grip on more aloof concepts, be they metaphysical, philosophical, political. I do think that poetry deals with the fundamental questions that concern every one of us, not only those of us who happen to write poetry; but it is in the precise and sensual details that these somewhat abstract concepts suddenly become tangible, and it is in these details, too, that we then quite possibly find insight and solace. MD: “Tea Bag” is made of 2 Haikus while “Rain Barrel Variations” is 14. What determines the length of your poems? JW: This is very hard to answer. In most cases, I believe, you just sense that the poem’s length is just fine as it is, and that every additional word or line would destroy the whole thing altogether, throw it out of balance. In fact, one of the wonders is that a poem which, in the beginning, had twenty or thirty lines and then, in the process of correction, is pruned and shortened down to, say, four lines, may contain much, much more in these four remaining lines than in the thirty lines before: Abundance in brevity, as it were. MD: Haikus are usually independent of each other, each a poem, and are usually about seasons and landscapes. You have expanded the scope of haikus and how they can be used, e.g. serving as tercet stanzas. Did you experiment with the form consciously? JW: I did, and I do so with other traditional forms as well. What makes the haiku so appealing is that, formally, it is relatively easy to do (at least if you focus only on the syllables and the lines, thus, the basic formal rules) but at the same time strict enough to force you to focus on your material, on the words and their weight, the sounds and their shape. And ten or fourteen of these, beaded as on a string, can form a sequence of little stanzas, tercets, as you said, which are as condensed as possible in themselves but also act jointly to form an overall picture or narrative. MD: Somehow I have been connecting your “Tea Bag” with your “Chameleon”: “more ancient than the bishop’s staff/which he drags behind him, the crook/of his tail.” That “sackcloth mantle” has transformed into the “bishop’s staff”. I have this fantasy that Marianne Moore would laugh when I read your poem “Chameleon” to her out loud. You also write about death and love but in an unconventional way. In the poem “Bedsheets”, “grandfather was embalmed in his/and carried out”. I loved the word “embalmed” but don’t get the next few lines. JW: Who knows? I for one am glad that you seem to like the “chameleon” poem. And yes, both death and love would, of course, be two of the fundamental concepts mentioned before, that always linger at the back of one’s mind. The image in “Bedsheets” is this (it is like one of those natural yet intriguing conjunctions a child would make, a child’s phantasy’s shortcut): the grandfather is carried out, embalmed like the Egyptians were, but the image of the grandfather lying there continues to be so very vivid and present —that the wasp the speaker discovers one year later is taken to be the transformed grandfather, has to be him, a shrivelled mummy, tiny, a pharao. telegraphic buzzing of a swarm of gnats. The mushrooms were also an expedition! What can be better when what we are looking for is also looking for us? The ending is so true: “listening for the gentle clicking from inside,/as we tried to hit on the right combination.” The most beautiful line is in the second stanza: “whatever’s good, she said,/needs filling with little more than with oneself.” I adore this line, so twisting and so thought-provoking. “Fennel” is also a love poem and I call it Jan Wagner’s “Love After Love.” Do you agree? Is there a place for love poems today? JW: I suppose you could call the poem on fennel that, yes. And as long as we exist and poetry exists there will be love poetry as well, that is rather certain. MD: You have many poems about vegetables. Do you love cooking? JW: I do. In fact, I know quite a few poets who are extraordinary chefs at the same time. There seems to be a mysterious connection. MD: Yes, such as how to mix the ingredients... What else do you enjoy doing? JW: Going for a walk, listening to music, meeting friends for a chat and for a glass of wine or a coffee, nothing extravagant. MD: When did you start writing poetry? JW: It would have been 1987 when I was sixteen years old – precipitated, of course, by reading poems that so delighted and excited me that I wanted to be able to do such a thing myself. MD: What exactly inspired you then? JW: Reading anything, I’d have to say – apart from all the fascinating things you discover in that age. MD: From 1987 to 2017, that’s exactly 30 years, making you a young veteran. What year did you publish your first poem? Do you remember the title of that poem? JW: I do not recall the title of the poem, but the year of publication was almost certainly 1992. MD: 1992... You were in college then. Who influenced you most? JW: Georg Heym and Georg Trakl, the so-called Early Expressionists, thrilled me when I first encountered them. A marvellous and very inspiring English teacher encouraged me to read more English language poetry, Shakespeare, of course, but also Dylan Thomas, Donne, Blake and Yeats. Later I discovered W.H. Auden, Ted Hughes, William Carlos Williams, Wallace Stevens – to name but a few. MD: It’s interesting that you listed Georg Heym as your first influence. Whose poetry do you like most? JW: Apart from the above-mentioned poets, I’d also name Zbigniew Herbert and Yehuda Amichai. But reading poetry is a process, isn’t it, that never comes to an end, which is exhilarating, and every year, every month there are more discoveries to be made, who knows in what language or country. MD: Did you start translating poetry first or writing first? JW: I started translating poetry only when I studied in Dublin, which was in 1994 and 1995 —Louis MacNeice was the poet I read that year and then tried to translate. MD: So you went to Dublin before going to Berlin for graduate study at Humboldt University. JW: I went to Trinity College for one year, studied English and Irish literature while at the same time writing and translating myself. JW: That is precisely what happened – and knowing that until then there hadn’t been any German translations at all of MacNeice’s work really encouraged me to give it a try myself. MD: Back to the German tradition, besides the two you mentioned, who else has influenced you? What about Rilke? His name appears frequently in the critical reviews of your poetry. What do you think of him? JW: I love Rilke’s New Poems, so yes, absolutely, but Rilke certainly is one of those poets you cannot get around, that you have to study rather closely if you want to write poetry in German. Other poets would necessarily include Goethe, Brecht and Benn. MD: Did you have other hobbies while in college? JW: Music, film, sports – the usual. MD: Did you ever form a circle of poetic friends? Or do you ever belong to a circle? JW: Yes, in the 1990s and the first few years after 2000 we met regularly with a group of Berlin poets, among them Björn Kuhligk and Uljana Wolf, in order to read and discuss our poems. MD: What are the critical moments that allowed you to make a break-through? JW: To begin with, discovering English-language poets like the ones I mentioned above, not least Dylan Thomas. Then, meeting people who wrote poetry as well, who ran magazines and were willing to publish my attempts on their pages. Later, co-editing a magazine myself (or rather: a literature box) called “Die Aussenseite des Elementes, “The Outside of the Element” for ten years. And finally, of course, actually finding a publisher for my first book. MD: You have experimented with many traditional forms. How do you subvert, let’s say, sonnets? JW: By rhythmical variation, and by using rhymes that are not to be found in any rhyming dictionary, by using slant rhymes and assonance, also consonance, all of which greatly expand the matter – and thus render possible what rhyme ideally does, namely to surprise the writer himself and gently force him into hitherto unknown imaginary and intellectual terrain. This, fundamentally, is the reason to use form and rhyme in the first place, at least for me. JW: It is a sonnet but at the same time language is overgrowing and subverting the sonnet with repeated rhymes and sounds contained in the German word for “bindweed”, which is “Giersch” – just like the weeds in the garden do. It is linguistically bindweed bursting the trimmed and well-tended form-garden. Incidentally, the word “Giersch” contains the word “Gier” meaning greed or want, which makes perfect sense, of course. MD: Magdalena is an interesting imagery in your poem “Self-portrait with a swarm of bees.” Symbol of both saints and sin. In Western culture, one is born guilty of sin. It’s the opposite in my Chinese culture. But saint or sinful, your “identities” are bees from all directions, not something born with. They can protect you like helmet and harness and can glorify you. But your true self is visible only when they vanish. Is it what you are implying? JW: A possible reading, I’d say. but at the same time they are “so lustrous, so above the east and west.” You have traveled widely. But you see more of it when you are part of it. Can you tell us what’s most exciting in the current poetry scene in Germany? JW: The diversity of it. There really is no dominating school, no single founding document the younger generation has subscribed to; instead all kinds of lines of tradition are seen as valuable and worth a look, so that taking the best from all these worlds results in a wealth of very individual voices and an extremely lively poetry scene. pharaoh of a bygone summer. each vanishing, till your noses almost touched. of mothballs in its nest. before a jump from unforeseen heights. clover, with the cleaving in its name. covers over clover, culling until all is gone but clover.